A prominent company in the medical device industry contracted Avalon Group to help design a consistent user experience for a hand-held medical device. Our project manager joined the development team and assisted the client by designing screen mockups, facilitating team review meetings, negotiating consensus among team members regarding the design, and documenting design decisions. When the engineer leading the project took a short leave, Avalon Group’s project manager acted as his proxy, keeping the work moving in his absence. When a technical problem threatened to derail a critical user study, our project manager proactively identified and implemented a solution, avoiding any interruption to the project schedule. With the help of the Avalon Group team, our project manager led the effort to document the requirements for the user interface, including the team’s rationale for key decisions defining the user experience. 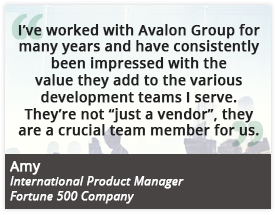 Avalon Group’s systematic approach to requirements definition ensured an effective document—consistent, clear, and testable requirements that serve as the foundation for the development and verification of the product. Our staff addressed change requests and managed updates to the document in the client’s requirements management system. The Engineer couldn’t be more pleased with the initiative shown by Avalon Group’s project manager and the quality of the documentation produced by the Avalon Group team. Our contribution was recognized as key for the project success.